Carrying the size separately instead of trusting the size stored in the record prefix provides some extra safety and flexibility. Definition at line 30 of file CVRecord.h. Definition at line 34 of file CVRecord.h. Definition at line 36 of file CVRecord.h. Definition at line 57 of file CVRecord.h. Referenced by llvm::codeview::TypeDeserializer::deserializeAs(), llvm::codeview::discoverTypeIndices(), llvm::codeview::discoverTypeIndicesInSymbol(), getSymbolKindName(), llvm::codeview::getSymbolName(), llvm::codeview::SymbolDeserializer::visitSymbolBegin(), llvm::codeview::TypeDeserializer::visitTypeBegin(), llvm::codeview::TypeDumpVisitor::visitTypeEnd(), and llvm::codeview::TypeDumpVisitor::visitUnknownType(). Definition at line 50 of file CVRecord.h. Referenced by llvm::pdb::DbiModuleDescriptorBuilder::addSymbol(), llvm::BinaryItemTraits< llvm::codeview::CVType >::bytes(), getHashForUdt(), getTagRecordHashForUdt(), and llvm::pdb::hashTypeRecord(). Definition at line 43 of file CVRecord.h. Referenced by llvm::pdb::GSIHashStreamBuilder::addSymbol(), createRecord(), llvm::codeview::TypeDeserializer::deserializeAs(), llvm::codeview::SymbolDeserializer::deserializeAs(), llvm::codeview::discoverTypeIndices(), llvm::codeview::discoverTypeIndicesInSymbol(), llvm::pdb::TpiStream::findFullDeclForForwardRef(), llvm::pdb::SymbolCache::findSymbolByTypeIndex(), finishVisitation(), llvm::CodeViewYAML::LeafRecord::fromCodeViewRecord(), fromCodeViewRecordImpl(), llvm::CodeViewYAML::SymbolRecord::fromCodeViewSymbol(), llvm::CodeViewYAML::detail::UnknownSymbolRecord::fromCodeViewSymbol(), fromCodeViewSymbolImpl(), llvm::codeview::getModifiedType(), llvm::pdb::SymbolCache::getOrCreateGlobalSymbolByOffset(), llvm::codeview::getScopeEndOffset(), llvm::codeview::getScopeParentOffset(), getSymbolKindName(), llvm::codeview::getSymbolName(), getSymbolNameOffset(), llvm::pdb::hashTagRecord(), llvm::pdb::hashTypeRecord(), llvm::codeview::isUdtForwardRef(), llvm::codeview::limitSymbolArrayToScope(), llvm::codeview::mergeIdRecords(), llvm::pdb::NativeEnumGlobals::NativeEnumGlobals(), llvm::pdb::NativeEnumTypes::NativeEnumTypes(), llvm::codeview::SimpleTypeSerializer::serialize(), llvm::codeview::CVRecord< TypeLeafKind >::valid(), visitKnownRecord(), llvm::codeview::TypeRecordMapping::visitMemberEnd(), visitMemberRecord(), llvm::codeview::SymbolSerializer::visitSymbolBegin(), llvm::codeview::TypeRecordMapping::visitTypeBegin(), llvm::codeview::TypeDumpVisitor::visitTypeBegin(), and llvm::codeview::TypeDumpVisitor::visitUnknownType(). Definition at line 41 of file CVRecord.h. Referenced by llvm::codeview::DebugSymbolsSubsection::addSymbol(), getSymbolKindName(), and llvm::BinaryItemTraits< llvm::codeview::CVType >::length(). Definition at line 52 of file CVRecord.h. Definition at line 39 of file CVRecord.h. 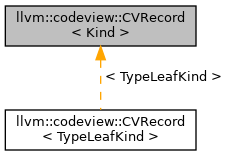 Definition at line 61 of file CVRecord.h. 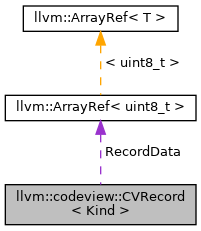 Referenced by llvm::BinaryItemTraits< codeview::CVSymbol >::bytes(), llvm::codeview::CVRecord< TypeLeafKind >::content(), llvm::codeview::CVRecord< TypeLeafKind >::data(), llvm::codeview::discoverTypeIndices(), llvm::CodeViewYAML::detail::UnknownSymbolRecord::fromCodeViewSymbol(), llvm::pdb::GSIHashStreamBuilder::UdtDenseMapInfo::getHashValue(), llvm::codeview::GloballyHashedType::hashType(), llvm::codeview::LocallyHashedType::hashTypeCollection(), llvm::codeview::GloballyHashedType::hashTypeCollection(), llvm::pdb::GSIHashStreamBuilder::UdtDenseMapInfo::isEqual(), llvm::codeview::CVRecord< TypeLeafKind >::kind(), llvm::BinaryItemTraits< codeview::CVSymbol >::length(), llvm::codeview::CVRecord< TypeLeafKind >::length(), llvm::codeview::limitSymbolArrayToScope(), llvm::codeview::CVRecord< TypeLeafKind >::str_data(), and llvm::codeview::SymbolSerializer::visitSymbolEnd().